Led Zeppelin’s Robert Plant reflects on the band’s 2012 Kennedy Center Honors in a new interview with L.A. Weekly. Plant, Jimmy Page and John Paul Jones received the honors at a star-studded event in Washington last December. “The charm of the people involved in the project, from the President and across the board...it was mind-altering,” he continued. "I've been thrust in front of royalty all over the world, kings and queens and princes...but these guys were actually having a good time! The three of us were amazed that that sort of thing happened. That wouldn't happen with Prince Charles!" 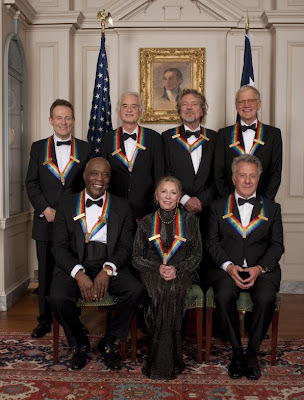 Zeppelin were on hand along with fellow 2012 recipients David Letterman, bluesman Buddy Guy, actor/director Dustin Hoffman, and ballerina Natalia Makarova. The annual award is given to those in the performing arts for their lifetime of contributions to American culture. Paying tribute to Zeppelin with live performances were Heart (featuring Jason Bonham), the Foo Fighters, Kid Rock and Lenny Kravitz. The L.A. Weekly session was to promote Plant’s upcoming US tour with The Sensational Space Shifters, which kicks off June 20 at the Palladium in Dallas, TX, with dates wrapping up July 27 in Brooklyn, NY’s Prospect Park.